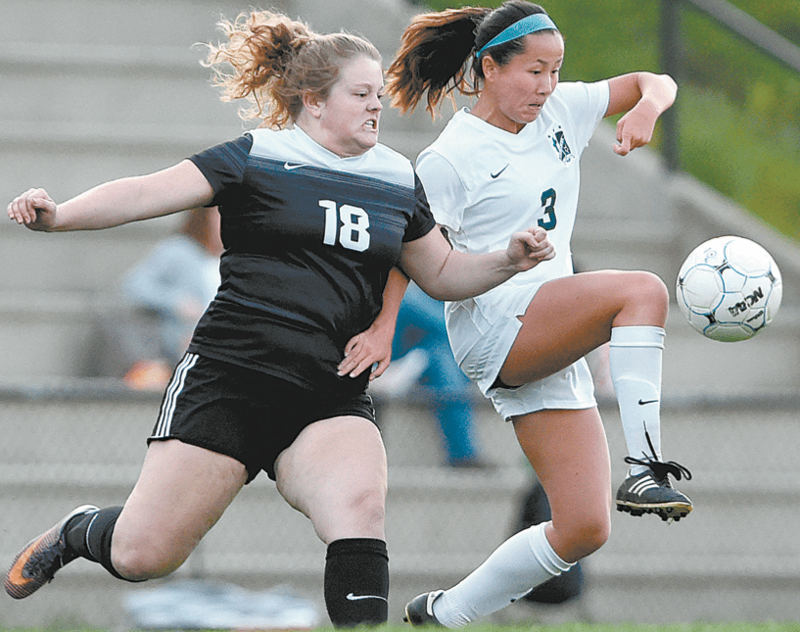 Mountain Brook’s Anna Windle, left, and John Carroll’s Kailian Davis battle for control of the ball. John Carroll will visit Homewood at 5 p.m. Thursday in a crucial Class 6A, Area 8 showdown. 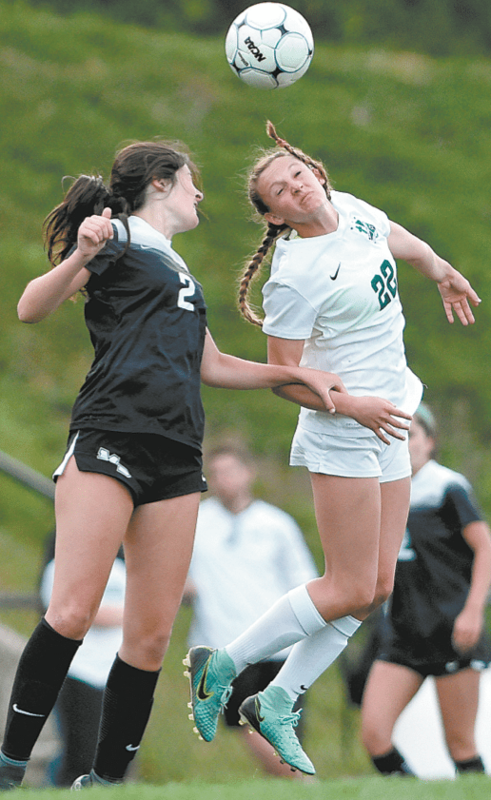 John Carroll’s Claire Davies, right, heads the ball over Mountain Brook’s Emma Blakely in an April 5 match. The Cavs won the contest 2-1. Journal photo by Mark Almond. More photos at otmjsports.com. Listen to the stories of any fishermen or hunter and inevitably you will hear about the one that got away. The John Carroll Catholic girls soccer team can talk about something similar. 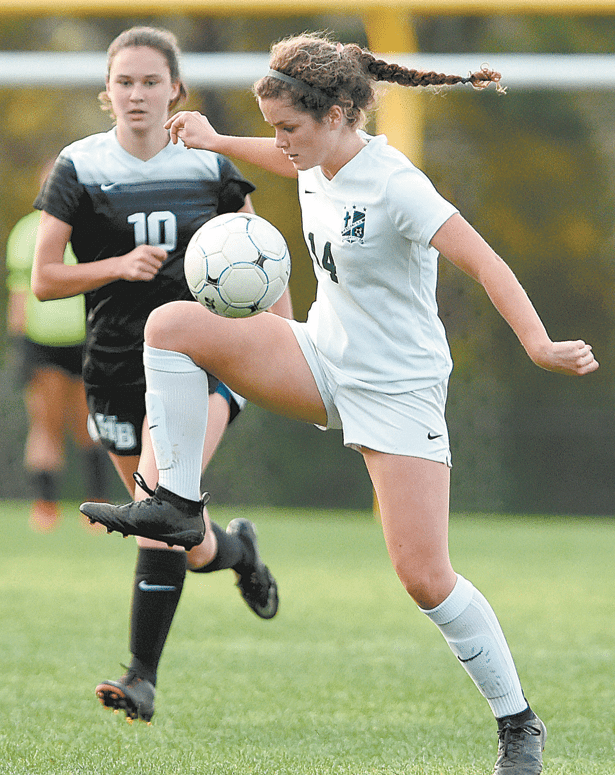 After winning three consecutive state championships, one in Class 5A in 2014 and two in Class 6A in 2015 and 2016, the Cavaliers’ streak came to a screeching halt in 2017 when they were eliminated by eventual champion Chelsea in the Class 6A quarterfinals. John Carroll lost on penalty kicks 3-2 (5-4), making the setback even more disheartening. Senior center back Carley Horner said the Cavaliers treated the match against Chelsea as almost a foregone conclusion. With their championship run over, the Cavaliers are not taking anything for granted this season. They entered this week with a 15-3- 1 record and ranked No. 1 in Class 6A. Farr and Horner, the team captains, are among six seniors leading the Cavaliers’ quest to reclaim the state title trophy. The others are left back Amanda Hall, forwards Gabby Bernal and Claire Davies, and goalkeeper Song Bowers. John Carroll’s Mary Grace Farr controls the ball in front of Mountain Brook’s Lamar Campbell. Hall, Bernal and Davies lead the team in goals scored, Farr leads the team in assists, Horner is a leading defender, and Bowers has recorded more than 50 saves. During the course of this season, the Cavaliers have won the Island Cup tournament in Gulf Shores and the Shamrock Invitational in Cullman. John Carroll will visit Homewood at 5 p.m. Thursday in a crucial Class 6A, Area 8 showdown. The Patriots handed the Cavaliers a 3-2 setback on Feb. 27 at John Carroll in their first meeting. The game will determine the area champion. The postseason begins April 26 with sub-state. The Cavaliers have their sights clearly set on the state tournament May 10-12 in Huntsville. “We’re aware of our capabilities,” Horner said. “We’re getting the mentality where we’re thinking we can go all the way.